According to the Center for Disease Control’s Second Nutrition Report, less than 10 percent of the U.S. population has deficiencies of most major vitamins and minerals. However, specific populations, such as pregnant women, infants, or the elderly, are still at risk for such deficiencies, and their nutrient imbalance may lead to serious medical conditions. For example, a recent study showed that pregnant women who had low vitamin D levels when they were 20 weeks pregnant were more likely to bear children with traits of autism. While the CDC confirms that vitamin D deficiency only exists in eight percent of the U.S. population, it notes that a quarter of the population still may be at risk for possible future problems. 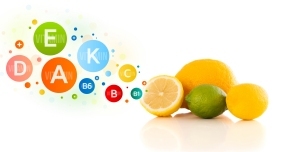 The best way to approach a vitamin or mineral deficiency is to first identify if you have one. The next steps should include consulting your doctor about a supplement option, or adding certain foods to your diet to address the specific deficiencies. Hair health is a good indicator a nutrient deficiency. A lack of protein or iron can lead to brittle and dry hair. To stimulate hair follicle growth while also improving your iron absorption, try eating kiwi. The fruit contains vitamins C and E— two nutrients that improve iron absorption when consumed together. A rich or decadent meal can lead to a loose bowel movement, but persistent episodes of diarrhea may be evidence that the body is not retaining nutrients. Staying hydrated by sipping liquids like tea or water between meals can help alleviate the symptoms, but it’s also important to avoid alcohol, carbonated drinks, and greasy foods until the condition disappears. Weak bones are a sign of inadequate calcium intake. The body draws calcium from the bones into the blood stream, but if the calcium is not replenished, it can lead to breaks and medical conditions such as osteoporosis, where bones become so porous and brittle that even a cough, bump, or sneeze can cause a fracture. Try adding collard greens to your diet; its calcium is more easily absorbed by the body than that in dairy products. Causes of high blood pressure can range from smoking or excessive salt consumption to obesity, stress, or just plain old age — but another cause is a deficiency in potassium, a mineral that helps relax the blood vessels. To ensure a proper intake of potassium, incorporate a banana into your morning breakfast routine, or microwave or bake a medium-sized potato for lunch.